Let's learn Go. The rules are simple, so you can start immediately. This text is organized so that you pick up the knack of playing Go a little every day and can play independently after ten days. The text is easy to study even if you know nothing about Go. If you already know something about Go, you can use the text as a review and deepen your knowledge. · Go is a game in which each side increases their territory using black and white stones played alternately. As shown in Dia. 1, the players place black and white stones on a board with a 19x19 grid drawn on it. Stones are played on the intersections of the lines. · Two players play a game, with one taking the black stones and the other the white stones. · Black plays first, placing one stone on the board. Next, White places a stone. The players play alternately. · Placing a stone is called 'playing' a move. 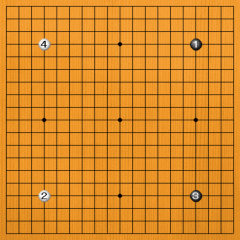 Go has some special terms, and learning them helps you to become familiar with the game. If you know a lot of Go terms, you will also feel like an expert, so let's pick them up gradually.